Every business that seeks to achieve maximum levels of profitability needs to think carefully about its pricing. Specifically, it needs to think about how often to change its prices. Once you identify and set the best pricing strategy for your product or service, it can be quite tempting to hold on to it. We know how you reason and we empathize – you spent considerable time and effort to set it up, it works so why would you ever change it? Well, you simply have to because every aspect of the market fluctuates. Your competitors, products, customer demand – everything. That being said, each aspect can have a direct influence on that ideal price you envision for your product. As with the majority of the price-related issues, there are certain pros and cons to adjusting prices on a frequent basis. 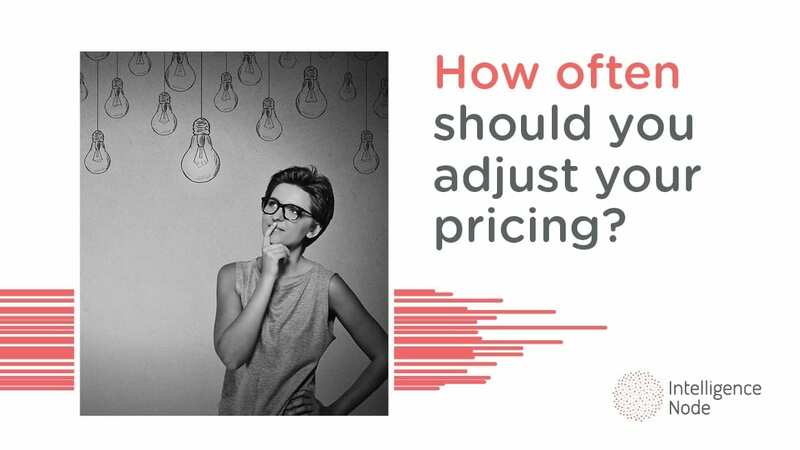 Businesses need to consider both sides of the pricing equation before deciding on how often they intend to change their prices. The change can have a huge effect, both positive and negative, on you and your consumers so this is not something to take lightly. As always, we are on the job to make that decision as smooth as possible. How often to adjust your pricing? First, it’s important to know that there is no general rule of thumb when it comes to modifying your prices. This is because of the frequency of changes within the market. Just look at the data for Motorola Moto G Plus smartphone, an older model. In the first week of May, there have been five changes in pricing for it. In addition, the growth stage of your company can also play a role in the proceedings. For instance, a small business might want to adjust its pricing in order to increase its market share while a larger company with more experience doesn’t necessarily have to frequently adjust its pricing. When is it okay to do it? If your competitors are cashing in on the virtually same product for slightly less of it, whether it’s the quantity or lower number of features or else, this is a signal that you can raise your prices. The key here is to accentuate the unique value your goods bring compared to competitor’s offering, especially if it’s a similar product at a higher price point. Customers are often willing to pay more but they need to know why your product is superior. When costs for the company increase, it’s rather normal to raise prices to offset the change in costs. This includes rising raw material, labor costs, changes in packaging and so on. During inflation (or periods of it), companies need to raise prices to maintain profitability, particularly if the increase is significant. In such cases, it’s better to do it gradually and raise the price over time instead of making one quick and large increase. If one or more of your competitors significantly reduce their price, you may need to follow suit and do the same in order to remain competitive. If a part of your business strategy is increasing your market share, then you might want to decrease your prices to encourage customers to pony up the cash. As costs regarding your product lower, you can opt to decrease the price as well. This might make your product and brand more competitive while improving the ever-valuable customer perception by rewarding loyalty. Getting rid of your remaining inventory in favor of new versions of your product almost automatically means prices go down. Take hardware companies for example – every new smartphone model means the older one is cheaper. Or, if you are selling clothes, seasonal products like winter jackets and sweaters don’t have the same pull in April. In any case, whether you want to raise or lower your price, the change must reflect your overall business strategy. When is it okay to leave current prices? How to know when the time is right for what action? This is the trickiest part of the equation. Setting the price is a constant, ongoing process that requires tons of research. The math is simple – your company will make more informed decisions when backed up by research. The past several years have seen a significant rise in technology use. It has effectively shifted the very core of price changes. Most notably, regarding our topic today, pricing optimization software helps businesses join all kinds of pricing data to form dynamic pricing methods that take into account a variety of factors like competitor actions, customer demand and more. Think about it. There is a whole list of your products that require price optimization at a product level to stay ahead of the competition. The need to account costs, customer, and sales performance takes time and resources. With dynamic pricing, a company is able to adjust its prices on the fly in response to market demands. With the rise of big data analytics, price adjustments can be made much faster as time is of the essence. By collecting and analyzing data about a particular customer, a business can more accurately predict what price the customer is willing to pay and adjust it accordingly. Since automation is key here, you can also create customized dynamic pricing rules which can follow certain market fluctuations. Your pricing strategy demands round-the-clock maintenance to keep your business growing. A new pricing strategy could perfectly align with the changes that have occurred since your last price update. It’s imperative that you research and analyze the market landscape on a regular basis and make price adjustments accordingly. The market doesn’t stay the same and neither should you. Bear in mind that prices should be adjusted only as often as your company’s objectives and goals dictate. Otherwise, you’re preaching to the choir and they’re not listening.